Sources say 244 year-old former president Andrew Jackson is privately seething over President Obama’s reluctance to have his political opponents shot: Wikimedia CommonsAs a service to our readers, every day we are delivering a classic moment from the political life of Newt Gingrich—until he either clinches the nomination or bows out. We’ll take a look at that last claim. Jackson spent much of his life in acute pain from the bullets lodged in his chest and left arm. That produced a natural state of irascibility. Or at least it would have if it’d happened to us. From a policy standpoint, Jackson had a 19th-century southern plantation owner’s view on race (in addition to serving as president, Jackson was a 19th-century plantation owner) and owned more than three dozen slaves—something that struck him in as not at all morally wrong. His views on human rights, checks and balances, internal improvements, and finance would be anathema to a large swath of today’s public. And like we said, he had a habit of discharging firearms at people he didn’t like. Our ruling: There are some definite areas of agreement—Jackson was an unabashed proponent of class warfare, for instance, suggesting he’d be sympathetic to Obama’s embrace of the 99 percent. His invasion of Florida in pursuit of the Seminole was cited by the Department of Justice in a memo justifying Obama’s Guantanamo detainee policy. 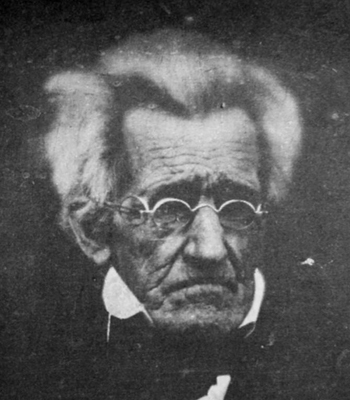 Nonetheless, Andrew Jackson, a man whose reputation was built in large part on acts of unbridled rage, would likely have been enraged by Barack Obama. Jackson, who allied with pirates at the Battle of New Orleans, might also wonder why the President has adopted such a hostile policy to Somali pirates. And Obama’s insistence on adhering to the 13th and 14th amendments would be a particular sore point. The bottom line is Washington, through the extension of civil rights to women and minorities in the decades since the Civil War, would have become something totally unrecognizable to Old Hickory. Andrew Jackson fear change. Andrew Jackson angry. Andrew Jackson smash.